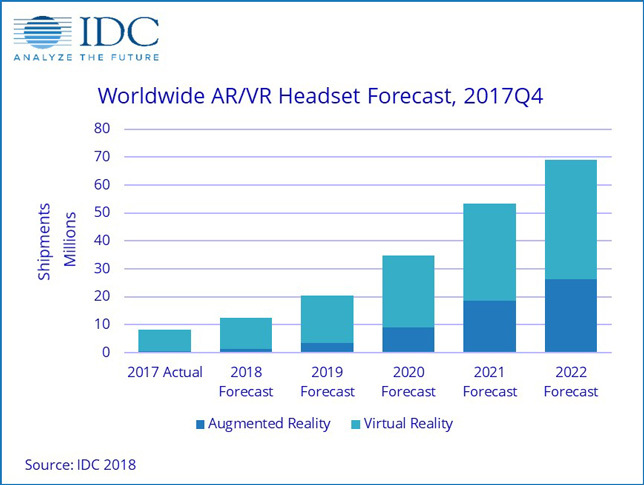 Augmented and virtual reality (AR/VR) headsets will see a compound annual growth rate (CAGR) of 52.5 percent through 2022 despite a lackluster year in 2017, according to a new forecast from International Data Corp. (IDC). In 2017 the AR/VR headset market saw a decline, largely because of reduced shipments of screenless VR viewers, which in turn was a result of vendors ceasing to bundle the viewers with smartphones. Following last year's poor showing, however, IDC predicts strong growth this year, with shipments surging to 12.4 million units on a 48.5 percent CAGR. "While there's no doubt that VR suffered some setbacks in 2017, companies such as Google and Facebook continue to push hard toward making the technology more consumer friendly," said Tom Mainelli, program vice president for devices & AR/VR research at IDC, in a prepared statement. "Meanwhile, Lenovo's success with its first consumer-focused AR product shows that consumers are beginning to understand what augmented reality is and the experiences it can provide. This bodes well for the category long term." "Virtual reality head-mounted displays (HMDs) will see a shift in product mix. Screenless viewers, once the overall leader, will see share erode quickly over time," according to information released by IDC. "Meanwhile, stand-alone and tethered devices — in the minority in 2017 — will comprise 85.7 percent of total shipments by 2022. Consumers will account for a majority of headset shipments throughout the forecast, but commercial users will slowly occupy a larger share, growing to nearly equal status in 2022." Screenless VR viewers will account for 34.9 percent of the market this year, according to IDC, but that share will shrink to just 8.8 percent by 2022. Stand-alone head-mounted displays (HMDs), on the other hand, will surge from 11.7 percent of the market this year to 29.8 percent at the end of the forecast period. Tethered HMDs will see a decline, though a more modest one than screenless viewers, falling from a market share of 43.3 percent in 2018 to 23.3 percent in 2022. "Augmented reality head-mounted displays will see market-beating growth over the next five years as stand-alone and tethered devices grow to account for more than 97 percent of the market by 2022," according to a news release. "IDC expects AR screenless viewers, the overall market leader in 2017, to peak in 2019 as stand-alone and tethered products become more widely available at lower price points. The rise of screenless viewers geared toward consumers tilted shipment volumes away from commercial viewers in 2017 and that's likely to continue in 2018; by 2019 the segment will shift back toward more commercial shipments." Augmented reality displays will, collectively, hold a smaller share of the market throughout the forecast. AR screenless viewers will also see a crash, dropping from 6.7 percent of the market this year to 1.1 percent in 2022. Stand-alone AR HMDs will see their market share improve from 2.4 percent to 19.1 percent and tethered AR HMDs will explode from 1 percent of the market this year to 17.9 percent of it in the forecast's final year. "There has been a maturation of content and delivery as top-tier content providers enter the AR and VR space," said Jitesh Ubranisenior research analyst for IDC mobile device trackers, in a prepared statement. "Meanwhile, on the hardware side, numerous vendors are experimenting with new financing options and different revenue models to make the headsets, along with the accompanying hardware and software, more accessible to consumers and enterprises alike."